Over 300,000 children worldwide are born with the Sickle Cell Disease (SCD), a genetic abnormality of the red blood cells in which they take a crescent or “sickle”- shaped appearance. Over half of these children die before the age of five. With over 300,000 babies born with the sickle cell disease every year, Nigeria has the highest burden of Sickle cell disorders in the world. The 19th of June every year is set aside to commemorate the World Sickle Cell Day. This year, we explore 6 facts you need to know about Sickle Cell Disease. Although sickle cell can affect people all around the world, the risk is higher in Africans or people of African descent. Sickle Cell Disease is not contagious or infectious. People who have the sickle cell disease may develop various complications such as anaemia, stroke, tissue, organ and bone damage as well as pain due to the inability of the sickle-shaped red blood cells to carry oxygen normally and to cause blockage of blood vessels. People with the genotype AS, are carriers of the Sickle Cell Trait (SCT) but do not suffer any symptoms of Sickle Cell Disease. They can however pass it on to their children. There is no cure for SCD yet. Although, some success has been recorded with bone marrow transplants. A person with SCD can live a long and active life as long as they undergo regular check-ups with a doctor, take their medications regularly, prevent infections through hygienic practices such as handwashing and drink lots of water. Currently, eHealth Africa is partnering with the University of Nebraska Medical Center (UNMC) and the International Foundation Against Infectious diseases in Nigeria (IFAIN) to implement a clinical trial of the HemeChip, a device that can detect the sickle cell gene in babies as young as 6 weeks old using little to no electricity. 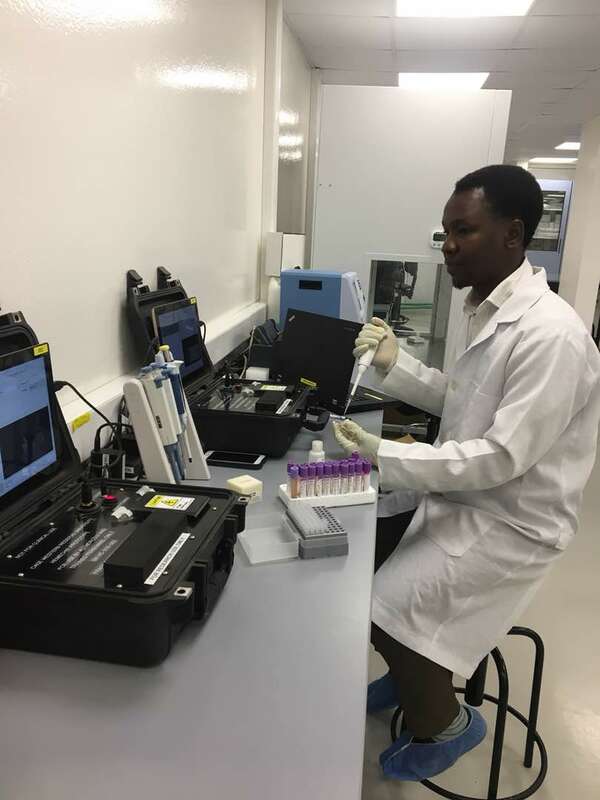 The HemeChip is a component of SMART (Sickle and Malaria Accurate Remote Testing), a solution that recently won eHA and its partners, Case Western Reserve University, Hemex Health and the University of Nebraska Medical Center (UNMC), the Vodafone Wireless Initiative Project prize. SMART is designed to diagnose, track and monitor sickle cell disease and malaria in low resource settings. This World Sickle Cell Day, eHealth Africa encourages everyone to get screened. Discovering one’s genotype is the first step in reducing the incidence of Sickle Cell Disease and preventing any more deaths and complications from occurring.